Every year thousands of baseball fans come out for an early peek at their favorite team and players. This sneak peek can be one of the best secrets of baseball, and offers a great opportunity for families to let their kids get up close to the players. 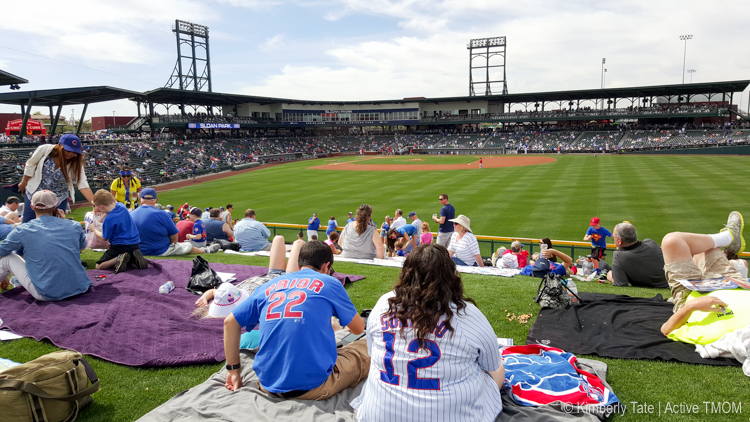 But before you plan your trip, be sure to read these tips to make the most out of your trip to Arizona for Cactus League spring training. April is approaching, which means it’s time for our favorite players to take to the field and play what is affectionately termed America’s game, baseball. But like any good sports player knows, practice makes perfect, and Major League Baseball has created an industry around this practice time. It’s known as spring training. 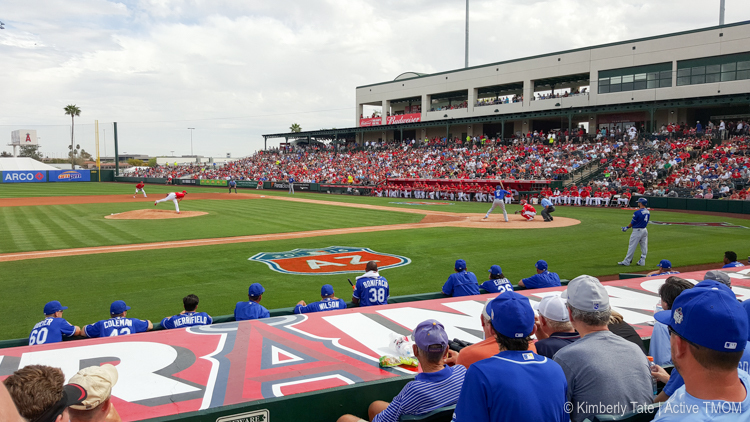 Occurring each March, spring training allows players and coaches to get back up to speed after the off-season, and gives fans an early taste of the upcoming baseball season. After a recent trip, here are seven things I think you need to know before you go. 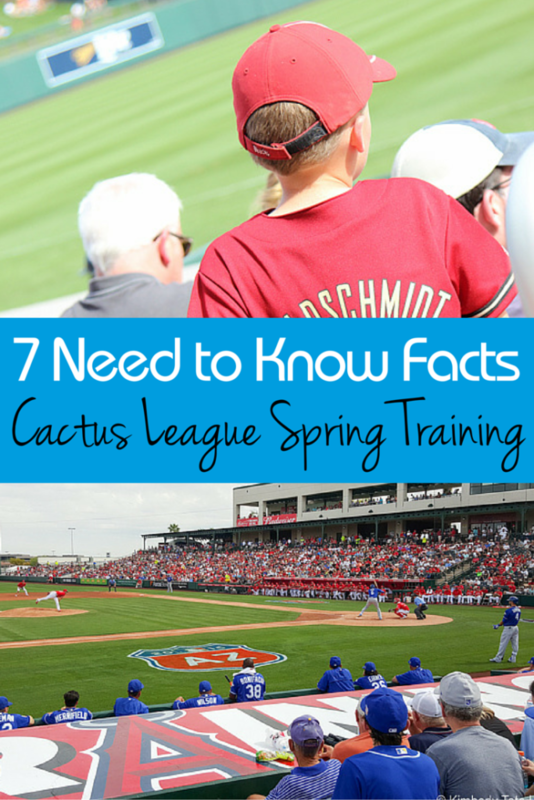 While spring training happens in Arizona and Florida, the cactus league spring training in Arizona represents 15 teams and occurs primarily around the Phoenix area, making it easy to plan visits to any or all of the 10 stadiums. You can go “on the road” with your favorite team and enjoy all the different stadiums while you cheer them on. The stadiums each have a home team, but you’ll find an open-minded crowd of baseball lovers in attendance, often seeing the opposing team as well represented as the home team. This stadium is a favorite for local families. I spoke to two families who shared how it’s a tradition now to head to the park during spring training opening week, and how their kids love seeing the players. 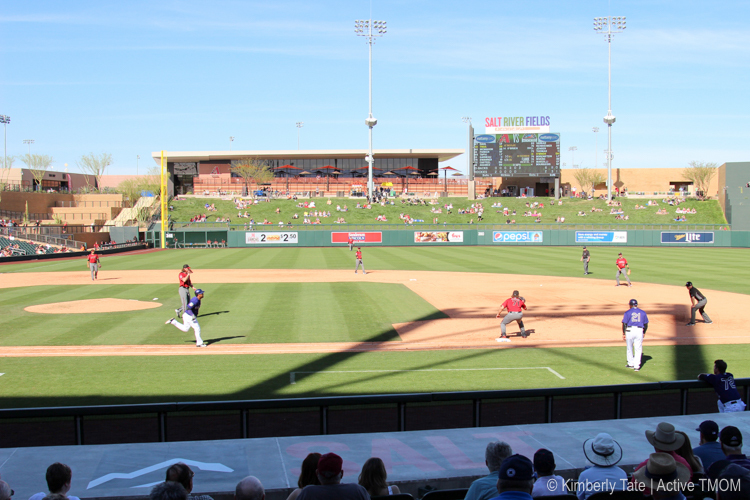 Salt River Fields was recently renovated and reopened in 2011, making it an up to date, and family friendly complex. Since I call Seattle home, the Mariner’s complex in Peoria held a soft spot for me. The stadium has even gone above and beyond to welcome their out of town visitors, giving their stores Seattle and San Diego regional recognition in their naming, and featuring foods like the Seattle Fog Cheeseburger and So-Cal Turkey Burger, and craft beers native to San Diego and Seattle. Peoria is going through an extensive remodel which will include adding a large family fun kids zone in 2017, plus they have great kids programs like their special “Peanuts Gang”, and chances for kids to sign up to announce the lineups and run with the players. Tempe is a bit on the smaller side for stadiums, and they have limited shade creating an interesting standing section on the walkway above the seats. The town of Tempe itself is easily accessible from Phoenix due to the light rail transportation option, and we were even able to take a trolley car from downtown Tempe into the stadium. Much easier than the folks who parked off site and had to hike a mountain to reach the entrance! Even if you’re not a Cubs fan, you really should take a visit to Sloan Park. 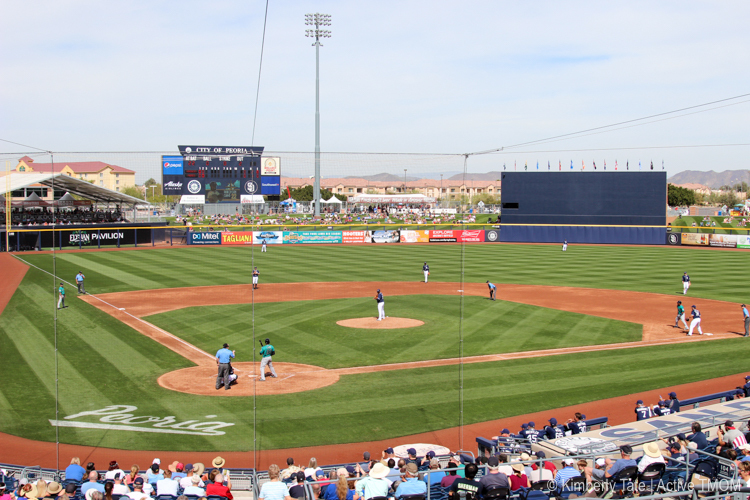 It’s the newest stadium in the cactus league with its birthday being February 2014. The stadium reached max capacity the day I attended, with a crowd of 15,443, just a couple below the sell-out crowd from opening day the day before. Cubs fans will truly appreciate the Wrigley Field nods and Chicago food specialties. The sunny weather in Phoenix makes it the ideal escape from winter weather elsewhere in the country, but that sun comes with a price. During an afternoon cactus league game, the sun will be blazing down on you while you sit in your seats. This means it’s worth a bit of pre-thought when choosing your seats for a cactus league game. For example, at Salt River Fields, the upper section is covered and offers great shade. The first base line seats also fell into the stadium shade earlier than our seats which were along the third base line. If you’re sensitive to the sun, I recommend calling the stadium to ask about shaded areas. Not all stadiums have shade coverings. Ticket Prices – the Best Secret! One of the reasons I think cactus league spring training is such a great vacation for baseball-loving families is because of the ticket prices. So many major league games during regular season come with price tags that can often cost in the hundreds for a family. However spring training tickets are priced much more reasonably, and some stadiums offer great family discounts. Peoria Sports Complex offers a discounted family package of 4 hot dogs, 4 small sodas, 4 bags of chips, 4 cookies and 4 lawn tickets for just $44 (prorated for larger families, discount available at Ticket Office windows only, not available on day of game or premium-priced games). Many of the stadiums have practice fields nearby where the home teams will hold practice. Some of these practice times are open to the public and free, making them a great chance for your kids to meet some players or just to watch your favorite team without buying a ticket. Although the MLB has a rule requiring teams to play at least three of their starters in the first four innings, spring training will showcase a lot of players trying to earn a spot on the team. Don’t expect to see a regular season, all pro game if you’re attending. On that note, make sure to arrive early if you want to see a favorite player since the pros typically leave the field after the 4th or 5th inning. Most of the stadiums offer lawn seating which is a great option for families. Bring a blanket and stretch out in the outfield, offering kids the chance to wiggle and run, and for you to even consider a cat nap if you’re so inclined. These seats are also typically the least expensive option, making them great for budget travelers. Please note, these seats don’t offer shade and umbrellas/popup shades are not allowed. For kids looking to get an autograph I have three recommendations: 1) attend an open to public practice, 2) come to the game as early as possible and make your way towards where the team is warming up on the field, often along the first or third base line, and 3) look for the stadium’s “autograph alley” or player exit and line up there around the end of the third inning. These are your best chances to grab an autograph from a player. If you’re attending a game at your favorite team’s home field, be sure to check out their team store. You’ll find a lot of gear and gifts, including specialty spring training merchandise. You won’t get a deal here, so prepare yourself to pay the same price you’d pay at your home MLB park. 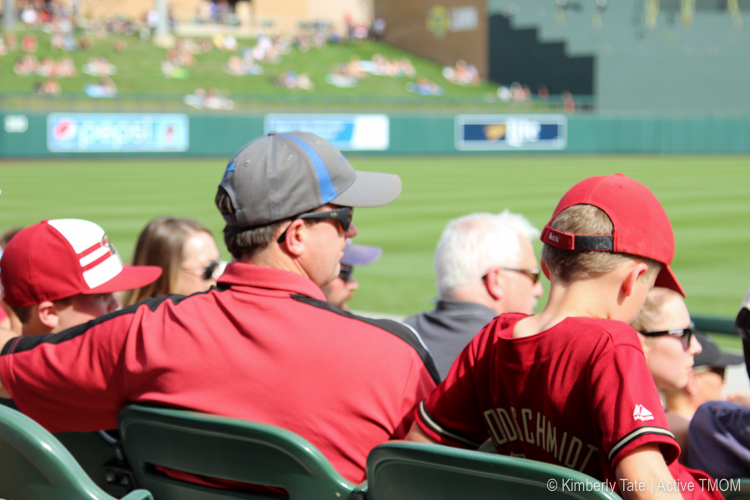 Now you’re ready to plan your vacation to Phoenix and cheer on your favorite baseball team! Tell me, which team is your favorite? Kimberly Tate resides in the Emerald City of Seattle, Washington by way of the yellow brick road from Kansas. 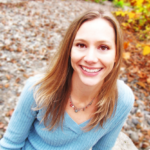 She’s the owner and writer at Stuffed Suitcase, a travel and family lifestyle site. 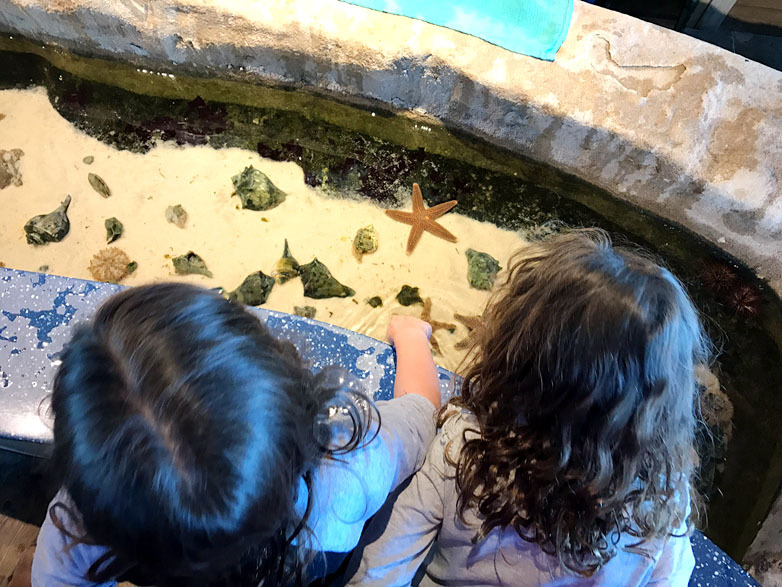 Her knowledge of family travel has come via her own experiences exploring the globe with her two daughters and husband. During free time she enjoys running, reading, and spending time online. She also enjoys sipping coffee and wine, but never at the same time.